Over the past couple months things have changed. You see, I cancelled my cable. (I was watching too much of the Oprah Winfrey Network anyway.) I’ve been purchasing the girliest bath products. My nails are chippy and my hair is up. And the weather’s changed too. It’s gotten REALLY hot, so I’ve been no baking things like these little squares of crunchy heaven. Can you believe I gave them all away? 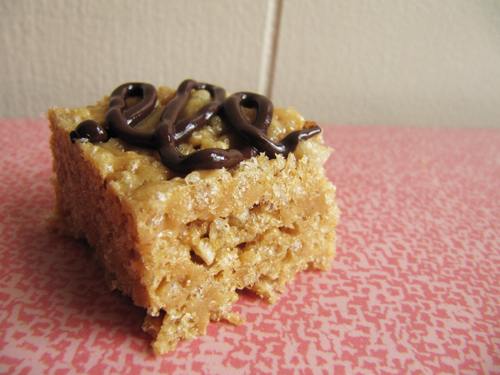 But who wouldn’t want a little peanut butter square with chocolate loopity loops on top? So there you go! Let’s no bake. Let’s share with the cute little ladies at the best antique store. Let’s go for a drive. Let’s listen to Telekinesis, and then let’s read in front of a fan and daydream about the next thing to make that doesn’t require the oven. Spray a 9 x 13 inch baking dish with cooking spray. Line with parchment or foil, spray again, and set aside. Measure out rice krispies into a large bowl. Meanwhile, in a large saucepan melt the butter. Add the marshmallows and stir until they’ve melted into the butter. 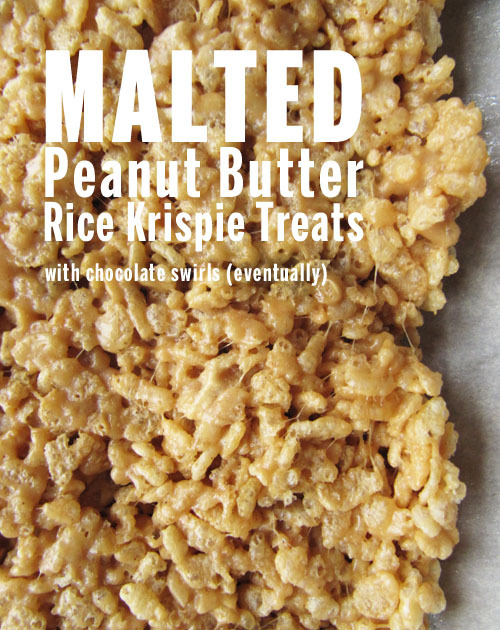 Add the malted milk powder, salt, and peanut butter and stir until combined. 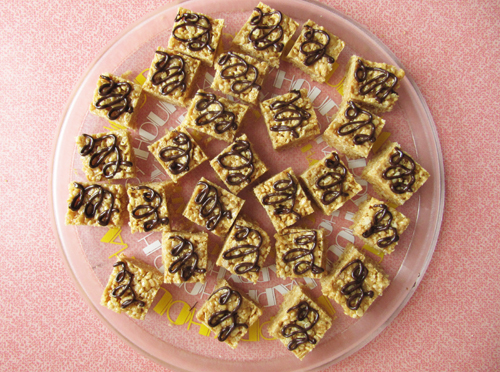 Pour mixture over rice krispies and stir quickly until all of the cereal is coated. Press mixture into the prepared pan. Cool on the counter, or if it’s a hot one, in the fridge. Once chilled use the foil/parchment to lift the treats out. Cut into squares. Melt chocolate and transfer to a sandwich bag. 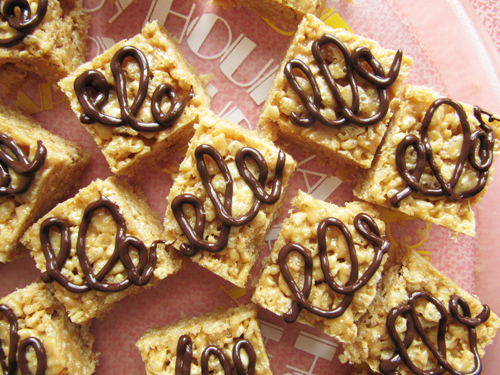 Snip the corner and drizzle chocolate over the squares. Chill until the chocolate’s set. Serve! Let’s no bake our summers away. hair up and girly bath products are just where it’s at! did the ladies of Oddfellows love them!?! I bet they did, who can resist no-bake swirly twirls?! Oooh! I’m going to look that up right now! Ugh it’s so friggin hot! I’ve been dreaming of things to no-bake. It will likely make up the majority of my weekend. Along with drinking iced tea and sweating. Cute, girly sweating of course. Right?! I’m camping out in the only room with AC in my apartment and also sweating… And yes. I’m sweaty betty in the most ladylike way. These look amazing. I need some good no bake recipes, as my oven is used too much even in this heat. However, I can’t imagine a circumstance under which I’d be willing to cancel my cable. I’m more addicted to TV than baked goods, and that’s saying a lot! Thanks! 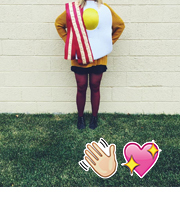 And, I hear ya, sister. it’s 106 degrees in toronto today with the humidity, so no-bake treats are at the top of my weekend agenda! can you taste the malt powder? i find it tends to get overshadowed by stronger flavours (i.e. peanut butter). ah! The humidity is the woooorst. Good luck! Love malt powder! I bet these are fantastic. Oh, Jen, I bet you’d totally love them. Those look perrrrrfect! No icey beers in the heat?? 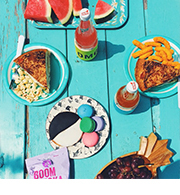 Previous post: Let’s celebrate summer with cheese.